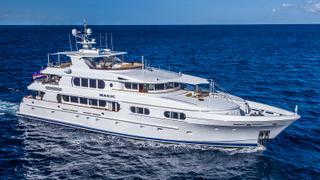 The 39.62 metre motor yacht Magic, listed for sale with Moran Yacht & Ship, has been sold. Launched in 2004 by Northern Marine, Magic is an all-GRP semi-displacement yacht featuring interior and exterior styling by Setzer Yacht Architects, which was commissioned to reconfigure her sundeck as part of an extensive 2014 refit. Other new features include a carbon fibre hardtop with UV-protected skylights and a hydraulic swim platform. Accommodation for ten guests is split across five staterooms, including a main deck master suite and four doubles, all of which benefit from en-suite bathroom facilities. The crew quarters allow for a staff of up to seven people and the shallow 2.03 metre draught makes her an ideal choice for Caribbean island cruising. Key exterior relaxation spaces include the sundeck, with its spa pool, sunloungers, sunpads and raised bar area, which is ideal for enjoying a cocktail, while the aft deck provides al fresco dining for up to nine people. Moving inside and her main deck saloon features a pair of sofas arranged in an L-shape configuration, as well as two armchairs. The more formal dining area includes seating for eight, while the upper saloon is an ideal spot for enjoying a movie or a games evening. Power comes from a pair of MTU 12V 2000 engines, which deliver a top speed of 16.5 knots, a cruising speed of 14 knots and burn just 35 gallons per hour at 11 knots, meaning a cruising range of more than 3,000 nautical miles is possible.